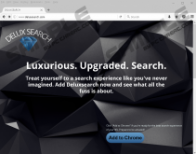 Deluxsearch is an application that promises to improve users’ web searching experience. This piece of software is promoted on deluxsearch.com (it is its official website), but, as has been found by our researchers, the button Add to Chrome, which works as a Download button, is inactive at the time of writing. This suggests that it might be distributed somehow differently. If you are reading this article also because you have no idea how Deluxsearch has been installed on your computer, you should go to delete this application because it is known to be an untrustworthy program even though it tries to convince users on its official website that it is a beneficial tool that will ensure “the best search experience of your life.” Research has shown that Deluxsearch has all the features of an ad-supported program, so it has been categorized as adware. It should be clear for you why this application is called an adware program after reading this article. Researchers specializing in cyber security say that Deluxsearch might be somehow related to the SuperWeb family of adware programs. They say so because adware from this family and Deluxsearch share two similarities: a) both SuperWeb adware and Deluxsearch cannot be downloaded from their official websites because the Download button is disabled and b) both SuperWeb programs and Deluxsearch have been developed to bring the third-party content to users. Instead of displaying pop-ups, banners, in-text ads, and other types of commercial advertisements like typical adware programs, Deluxsearch might change the settings of browsers by setting a new homepage, search engine, and the New Tab page upon installation. Then, it might start showing the so-called “advertising-supported search results.” Since the settings of a browser can be easily changed to Yahoo!, Google, or Bing, it has not been put into the category of browser hijackers. Unfortunately, it does not mean that it cannot cause any problems. Advertisements provided for you if you use the search box of Deluxsearch might take you to untrustworthy web pages. Some of these websites might even promote malicious software. In other words, it is not safe to click on these ads. They will no longer be provided to you only if you delete Deluxsearch. If you let it stay, you might still click on ads accidentally even though you promise to ignore them. Fortunately, as has been found by researchers at pcthreat.com, Deluxsearch does not gather personally-identifiable information “unless you contact us and provide us with that information.” It seems that your privacy is safe, but you should still be aware of the fact that it is interested in a bunch details that are considered non-personally identifiable, e.g. the information collected while using this extension. It consists of IP address, search terms, URLs of websites visited, and, finally, browser and computer type. Most probably, these are not the only details recorded by this application. If this does not bother you, you can keep it, but do not forget that privacy-related problems are not the only ones this software might cause. Security-related problems that might arise are definitely much serious. Since it is impossible to download Deluxsearch from its official website even though it exists, and this extension cannot be downloaded from other reputable sources, it is very likely that it comes bundled. According to our specialists, it should come bundled with free applications that can be downloaded from file-sharing and similar third-party websites. Clicking on an untrustworthy advertisement could have resulted in the entrance of Deluxsearch as well. The situation might repeat itself in the future if you are not careful. Since this is the most popular undesirable software distribution method, you might encounter other untrustworthy programs as well. You will be safe only when you start being more careful and install a security application on your system. Deluxsearch should be gone from your computer together with the homepage, search tool, and the New Tab page it sets after the deletion of the browser extension from Google Chrome (yes, it should work on this browser only). It might not be very easy to reach the Add-ons Manager to erase this extension, especially if it is the first time you are going to do that, so specialists have prepared the step-by-step manual removal guide for inexperienced users. Feel free to use it. Click the menu button in the top-right corner to open it. Select the Deluxsearch extension and click the recycle bin icon next to it. In the confirmation window, click the Remove button. Quick & tested solution for Deluxsearch removal.